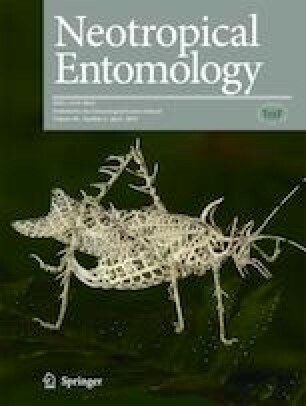 The present research aimed to investigate the compatibility of entomopathogenic nematodes (EPNs) and registered insecticides for the control of Tuta absoluta (Meyrick) (Lepidoptera: Gelechiidae) in the tomato crop, as well as the susceptibility of pupae of T. absoluta to EPNs combined with different percentages below the recommended dose of compatible chemical insecticides in laboratory conditions and in the greenhouse. The species of EPN used was Heterorhabditis amazonensis JPM4. The insecticides used were Actara®, Premio®, and Warrant®. In the compatibility test between the EPNs and insecticides, the viability and infectivity of the nematodes after contact with the insecticides were evaluated. An assessment of the efficacy of the combined application of different doses of the insecticides and the EPNs on T. absoluta was carried out in the laboratory and greenhouse. The efficacy of the combined application of the insecticides and the EPNs on T. absoluta via soil was carried out at application intervals of 1 and 2 weeks. The EPNs were compatible with the three insecticides tested. In the laboratory, there was an additive effect of the combined application of insecticides and H. amazonensis as the dose of the products increased. In the greenhouse assay, the combined application of EPNs and insecticides induced mortality above 48%, and the combined application of EPNs and Warrant® 75% presented 60% of mortality. The weekly and fortnightly applications were effective in controlling T. absoluta, and there was no difference between the insecticides tested when applied together with the nematodes. The authors are grateful for financial support from CAPES – the Coordination for Improving Higher Education Personnel. PHSS, ASN, AMJR and FSS planed, designed, and executed experimental work; PHSS and ASN conducted data analyses; PHSS, ASN, VA, AMJR, and CCF wrote the manuscript.